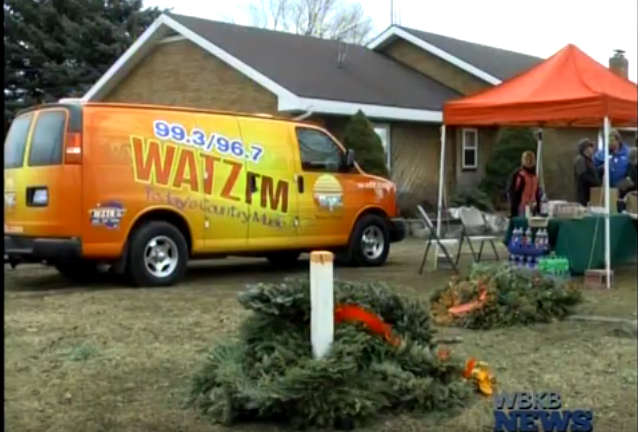 Today WATZ hosted their first annual Christmas wreath toss in conjunction with the kick off of the Alpena Area Chamber of Commerce fireworks fundraising event. Taking place outside of the WATZ studios local residents were encouraged to bring in their wreaths and also participate in the toss for prizes. Alpena Area Chamber of Commerce President Jackie Krawczak said the wreath toss is a great way to benefit the 4th of July firework celebration for the town of Alpena to enjoy. Krawczak said the fireworks put on yearly at Michekewis Park cost over $22,000 and is funded completely by donations. “We don’t know how many people watch the fireworks, but it’s thousands, and thousands of people. We’re pretty sure if every one of those people gave a dollar or two to help support the fireworks, we’d have no problem raising the money. But there are a lot of people that just want the show for free and they just think it gets funded by someone else. Really it should be everyone who watches them pitching in and so we will be done here. Come get a bracelet, and we’ll be at other events until the 4th of July doing more sales because it’s really important that we get as many people to pitch in,” she explained. All of the wreaths at Thursday’s event will be recycled. If you couldn’t make the event but would like to purchase fireworks bracelets to benefit the 4th of July fireworks display, you can stop by the Alpena Area Chamber of Commerce anytime during business hours.